Let's apply the same approach described in the previous posts to the TNOs. I downloaded some days ago a list of 2298 TNOs from the Horizons Web-Interface. 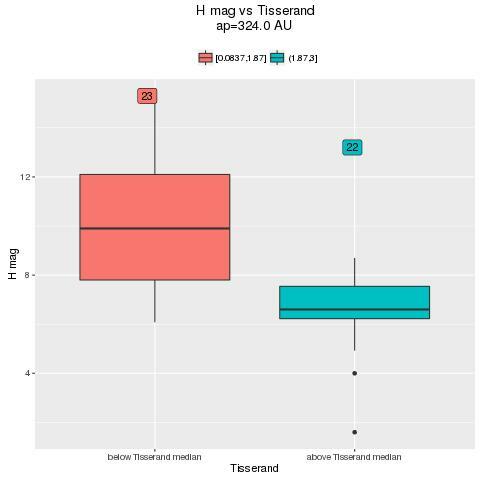 After reading it in an R dataframe, I have plotted the Spearman correlation versus Tisserand parameter with respect to a generic body with ap varying between 20 AU and 1000 AU. 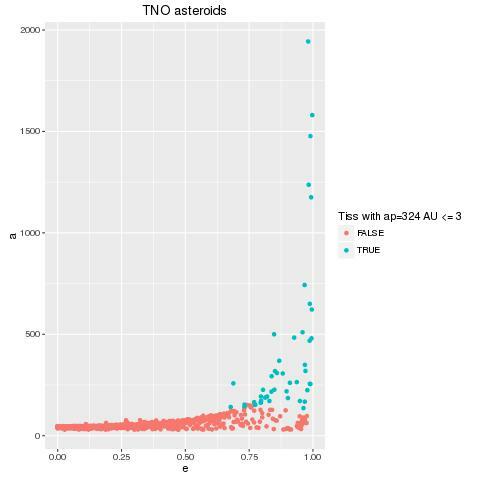 Important: I added a filter so to include ONLY asteroids with T <=3 ... this implies that the numerosity of the asteroids is not constant along this plot. After some trials, it seems to me that there is a moderate correlation (better: anti-correlation) for ap = 324 AU (red vertical line). 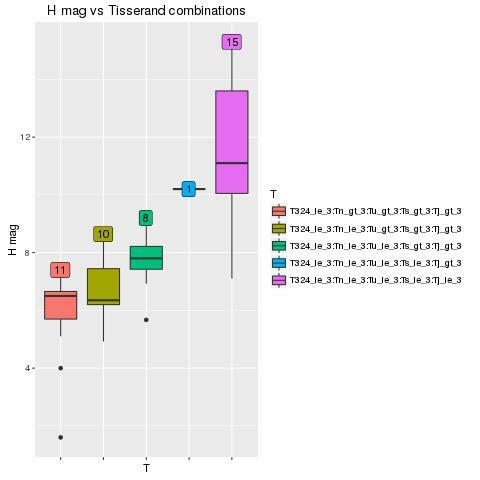 This is visible in a rough but clear way if you just make a boxplot showing the different H mag distributions in the first and second half of the Tisserand range. It must be said that the total number of TNOs in this plot is only 45: so I am not sure whether this is significant. It must also be said that these 45 asteroids are very interesting: among them we can find Sedna and other famous Extreme TNOs that are being studied extensively because their orbits might have been shaped by an unknown massive planet waiting to be discovered. Another interesting aspect is described below. Let's calculate the Tisserand parameter Tn with respect to Neptune. 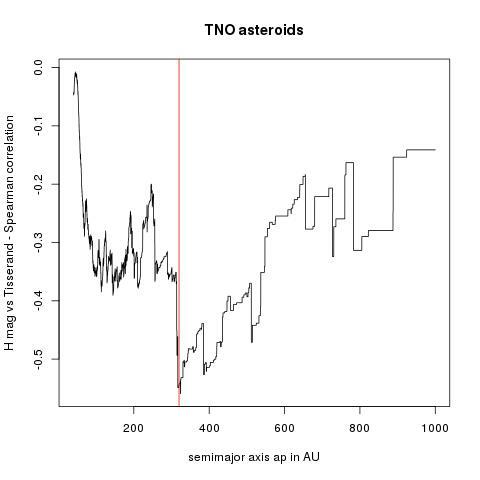 After that we can flag every asteroid TNOs as Tn_le_3 or Tn_gt_3 depending on whether Tn is less than 3 or greater. Furthermore: we repeat this process for Uranus, Saturn and Jupiter. Of course, following the same convention, all our 45 TNOs have T324_le_3: this is how we chose them. the brightest TNOs are those who have any Tisserand parameter with respect to outer planets greater than 3.
when Neptune, Uranus and Saturn come in ... same as above ... only 1 asteroid. when also Jupiter come in ... we find the darkest TNOs of this group of 45 TNOs. is this an expected / known result? is it a ... statistical fluke?